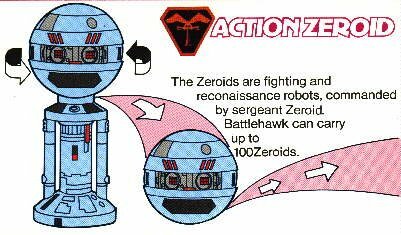 The Bandai ' deluxe ' Action Zeroid is a 5.25 inch high model of Sergeant Major Zero on his pedestal stand. Inside the Zeroid is an offset weight, and a spring wind-up mechanism. The Zeroid is wound up by rotating it while it is attached to its' pedestal ( holding the pedestal still ). 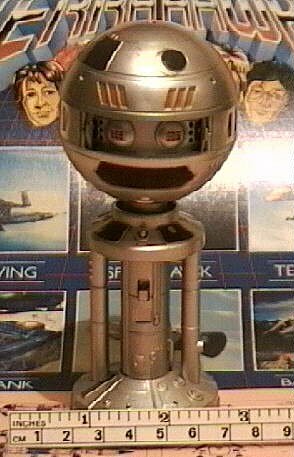 Press a release catch at the front - centre of the pedestal and the Zeroid 'jumps' off and wobbles around on the floor. 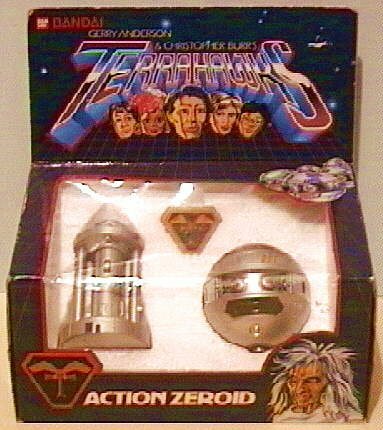 The Action Zeroid comes complete with a Terrahawk badge. Artwork from the underside of the Action Zeroid box.